Mega Sale! Save 21% on the 14k gold evil eye necklace, 14k solid gold by Zoe Lev Jewelry at Nicky's Blog. Hurry! Limited time offer. Offer valid only while supplies last. 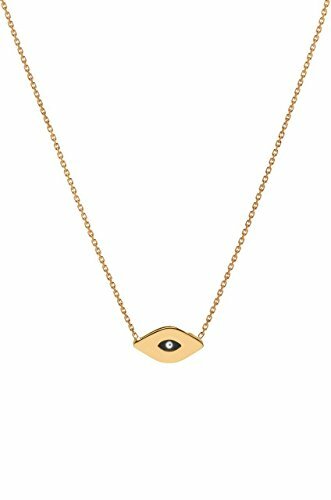 14k solid gold evil eye charm hanging form an adjustable 16'' to 18'' cable link chain necklace, in your choice of 14k solid white and yellow gold. 14k solid gold evil eye charm hanging form an adjustable 16'' to 18'' cable link chain necklace, in your choice of 14k solid white and yellow gold. If you'd like it in 14k rose gold, simply request ''switch to 14krose gold'' in the comment box at checkout and we ll do so. Made in L.A. Size of evil eye: Approx. 0.4''(H) by 0.6''(W) Weight : Approx. 2.7 Grams Ships in 1-4 business days Comes gift ready in a beautiful custom jewelry box wrapped in satin ribbon.